WASHINGTON (WPVI) -- Former FBI director James Comey stepped out for some 'fun' Saturday with his wife. They took in a matinee of the touring Broadway musical "Fun Home" at the National Theatre in Washington. 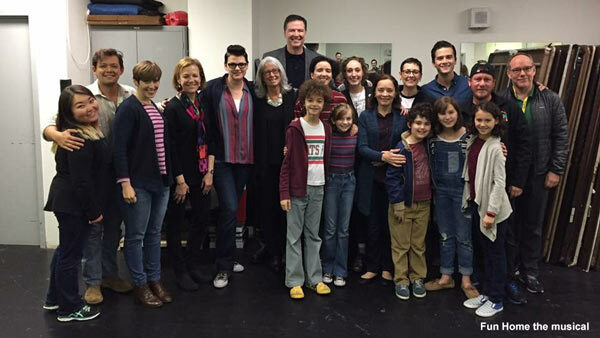 On Twitter, the musical posted a group photo of members of the cast with Comey and his wife Patrice. This was Comey's first public outing since he was fired by President Donald Trump on Tuesday. "Fun Home" is a true story about cartoonist Alison Bechedel, who explores her own sexuality as a lesbian, and the suicide of her father, who led a gay, closeted life. It won a Tony Award in 2015 for best new musical. One of the show's lead producers, Barbara Whitman, told The New York Times that the Comeys purchased the tickets awhile ago. "Their daughter saw the tour in Chicago and told them they had to see it," she said. "They were wiping away the tears as they came backstage to meet the cast. He said something to the effect of it was the best thing they could have picked for their first outing." The National Theater is just blocks away from the White House and FBI headquarters.